NE corner of German and King Sts. 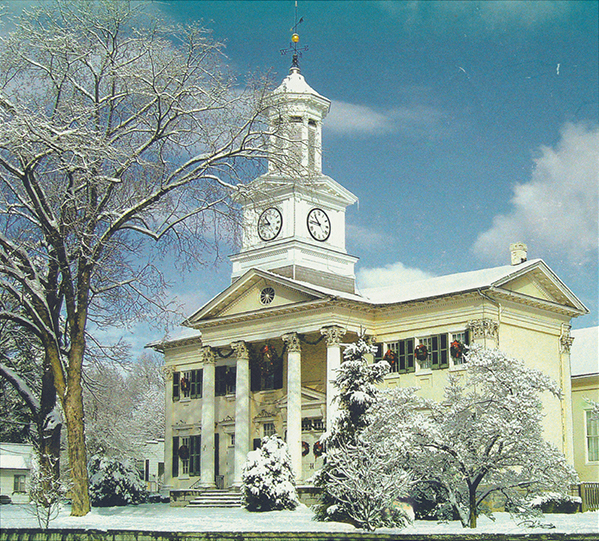 This imposing Greek Revival structure was erected in 1859 by Rezin Davis Shepherd, who intended it to be a town hall. A major benefactor of the town, Shepherd grew wealthy as a businessman in New Orleans after the Louisiana Purchase of 1803. At the time of his death in 1865 he was said to be one of the major property owners of New Orleans though he also maintained a residence in Shepherdstown. The clock in the tower, donated to the town by Shepherd in 1842 and originally housed in the old Episcopal Church, was moved to the town hall tower in 1860. Though neglected during some periods, the clock has been maintained in recent decades and still strikes the hour. After the Civil War, the building served briefly as the county courthouse, and the wings were added. When the county seat returned to Charles Town in 1871, the Shepherd heirs deeded the property to a board of trustees for the town. In 1872, the trustees in turn leased it to the state, and the town hall became the first building of what is today Shepherd University. In 1927 it was named in memory of Joseph McMurran, Shepherd’s first principal. Construction of the “College Wall” along two sides of the lot began in 1859, but the wall, of hand cut stones, remained incomplete until after the Civil War. Generations of the town’s youth have congregated at the wall to observe the passing scene, ignoring an 1896 town ordinance imposing a dollar fine for loafing on or near the wall.